I'll post most things here. I have been really awful at deleting everything I do because I can see what's wrong with my stuff, but I have a hard time correcting my mistakes. Sketches from late 2016 and some recent ones above. The “X” indicates things I took inspiration off of Cyancapsule because they make cool things. The rendered lady took about an hour. Very awesome stuff! Love the little Bridgeman studies! Dnbbeats wrote: Very awesome stuff! Love the little Bridgeman studies! Ah, someone noticed the Bridgman stuff haha, thank you. Last edited by Lucieth on Mon Apr 03, 2017 1:59 pm, edited 1 time in total. Pharah and Tracer from Overwatch, derpy perspective Lucieth and Cammy. And misc ladies. I’m using Clip Studio Paint, and my first impression is that this program is worth the money I spent on it and then some. Trying to figure out my “style”. I’ve been consistently drawing for a couple of weeks now and I’m improving at increasingly faster rates. My pitfall has always been stagnation. 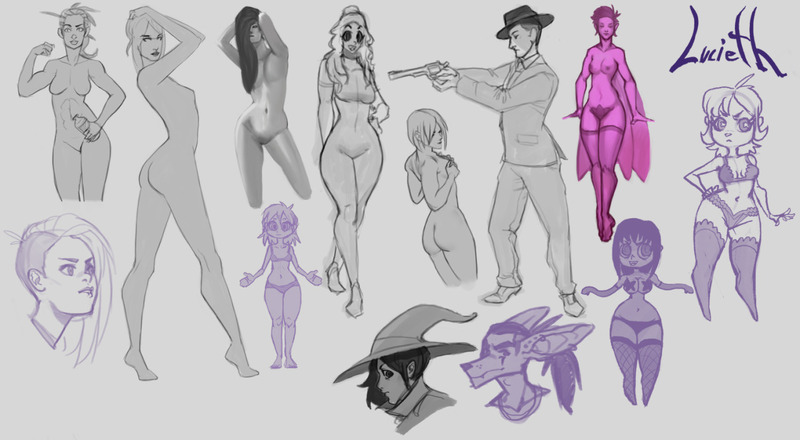 Some reference sketches and a lot of stuff from imagination. Things are very sketchy on purpose, and I didn't actually correct some of the errors that I started seeing (like the red head and her weird crooked nose). I decided to give things a little bit of colour. I'm still working with Clip paint studio here since I think drawing is better with the program, contra Photoshop. But I'll post some more paintings soon. More stuff. These are done in Photoshop as I'm still more comfortable with the brush customization in PS. They have a softer feel, and no matter what I do with Clip Studio Paint they always seem a little rougher. My sketches are usually a little "rendered" unless I'm doing croquis or thumbnails. I also completely messed up some of those Sinix masks, which is freaking embarrassing. But it's a good reminder to myself, so I'll leave it in. First of all, great seeing you posting a good amount, I always value dedication very high. Keep it up and get out of your comfort zone a bit more. By that I mean drawing some more variety of body shape and maybe gender. I love your gestures and lines in your female characters, but I think switching it up from time to time and coming back will help with variety. Anatomy wise I'd suggest drawing some more feet and lower legs! I draw a lot of gesture drawings with quickposes, have a decent sense for proportion and the feet-connection/form of the feet feels a bit off. or maybe the lower legs just have to be longer. In comparison your hands are a lot better, I love how you connect the wrist and the width of your elbows (well that sounds kind of weird ). The critique is very welcome, thanks! I completely agree with the critique. I'm aware that my lower body anatomy is pretty horrid and I've done leg sketches for the past few days because of it. And I'm actually hopeful that I won't delete these male studies I've been doing. A plus on that is also bodies in perspective, something else I'm also practicing lately. Still very picky with my posts, though. I make a lot of things that I never save and have a bunch of guys among the sketches that just don't survive. I should probably stop doing things from imagination while I lack understanding of certain parts of the anatomy. 2017 is supposed to be a more productive year, I won't disappoint. A single day of "Draw whatever the heck I want and don't worry about a thing". I apologize for the lack of diversity and reference, anatomy and creativity on this one. Most of it is just sketchy sketches and stuff. But I’m starting to enjoy “art”. I had an old photo of one of my old 2005 sketches, one of the first Lucieth’s I ever did. Thought it be funny to draw the character he used to be, and how he looks now (more or less). I am doing muscle/anatomy studies, and I think I saved the ones from yesterday but the file is corrupted. I need to remember to save my things and put them up here. If not for anything but my own sake. This is from early April. I did a quick Renekton from League of Legends, a game I haven't touched in years but someone requested I'd do it. Frankly doesn't look like the character yet, since this is just a WIP and I still have quite a bit of way, and a lot to learn. Wow loving the forms and the anatomy, something to strife for! My first impression is that the head appears quite flat, the back is rendered very well though! Also the values from his left arm and the back seem a bit too far apart, it looks like the distance is larger than it would be necessary. It's got something to do with colour profiles and things. And no matter what or where I change things it just remains a problem for me. I can see what you mean with the head as well. I figured he'd have a little extra skin from his neck like some reptiles, but it also doesn't actually work for the character so I'll remove it. The head will most likely be redone, he doesn't look like a crocodile/alligator to me at all.